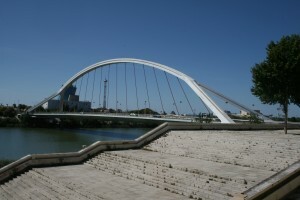 As Expo ’92 was built across the street from the main city new bridges were needed to provide access. We met at Plaza Nueva to start class for the day. 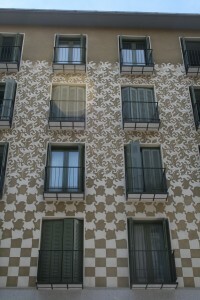 We had one of the best locations for a hostel with the AAE Lisboa. 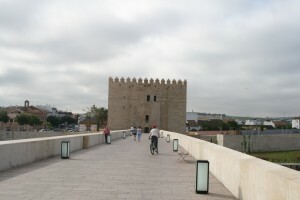 It was located right on a plaza just a short walk from the meeting point in the morning. Today we traveled for the second time on a train but this ride was significantly shorter but took much longer because the trains did not travel as fast as the AVE high speed trains. The difference between the two rides is staggering and shows how a high speed train network can improve over a standard network making it actually competitive. We started the day on the Roman Bridge. We had an extra day off and after the week in Madrid we spent it relaxing. At night we had a ride on the RENFE AVE train from Atocha Station. This was the first major high speed rail line built in Spain. In terms of using this over air travel I am totally for the train because the time is not much different and the amount of time you need to arrive before departure is minimal. It is possible to show up to the train 15 minutes before it leaves and make it on without having issues. Also, unlike airlines, the trains are very reliant with RENFE giving a guarantee that if a train is more than 20 minutes late you get a 100% refund (I would like to see an airline do that and stay in business). 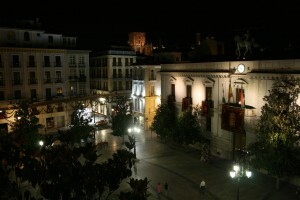 The train ride was great and we just had a short walk to the hostel when we got to Cordoba. In Cordoba we stayed at the Hosteling International – Instalacion Juvenil which was a very nice hostel that was simple but provided free breakfast. After we got in the hostel we went out and took a walk to see what was around and found we were just 5 minutes from the meeting point on the Roman bridge. Built in a still somewhat lower-end neighborhood this library was constructed on a tight budget. The building sits as a skyscraper among the surrounding buildings. 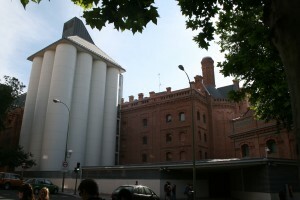 The Biblioteca Regional and Archive is a conversion of an old brewery. The building is split in two separate parts, the Library and the Archive. The Library is held within the old building and has turned the old silos into storage space. We started the day by going to see another archive building. The Biblioteca Regional and Archive is a new complex that expands on the old Aguila Brewery. We then proceeded south out of the center of the city. 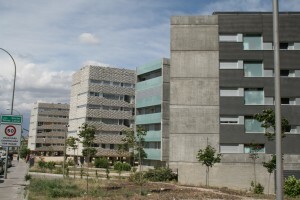 We arrived at a lower-end part of the city where there has been some new development including the Biblioteca Publica Jose Hierro. From the library we went to see some of the new housing projects. This is one area where the difference between America and Spain is easily apparent. In what is easily the best day of the trip we made our way to Toledo. Again we started our day in Atoch Station but instead of getting on a regular train we got on to a high speed train. I have for a long time liked the idea of a high speed train network and this was the first time I have been on a high speed train. The high speed train was very nice and found the ride smooth. We made it to Toledo in a half-hour versus the hour it takes to drive it in a car. 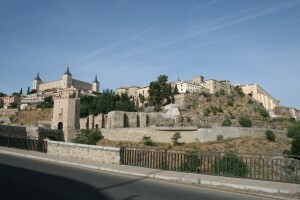 Upon arrival in Toledo we started the walk to the old city which sits up on a hill above the surrounding area. 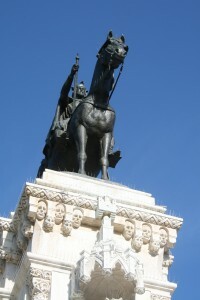 In the morning we met at Atocha Station to take a train out to El Escorial. 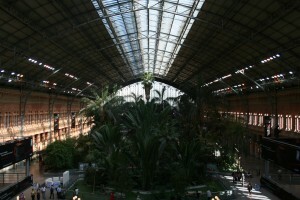 Atocha Station was expanded recently to meat the new demands of the high speed trains. This addition by Rafael Moneo holds the new train sheds while the original train shed was turned into a greenhouse. 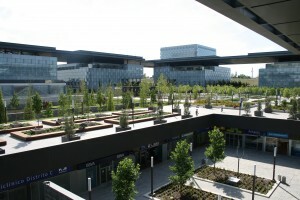 The new headquarters for Telefonica are built on the outskirts of Madrid. Instead of creating a single large building the new headquarters are a complex that consists of office space as well as restaurants, grocery stores, and a gymnasium. 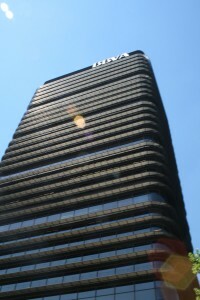 Torre BBVA is part of the group of buildings built in the 1970s. The entire building is supported on a central core with the floors cantilevering out. 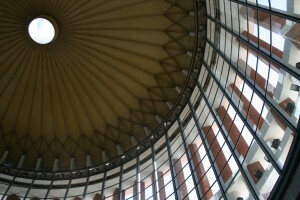 Although the building was built before the green movement this building employs the use of sun shades to help keep it cool which give the building its unique look. In the morning we visited the Museo del Prado. 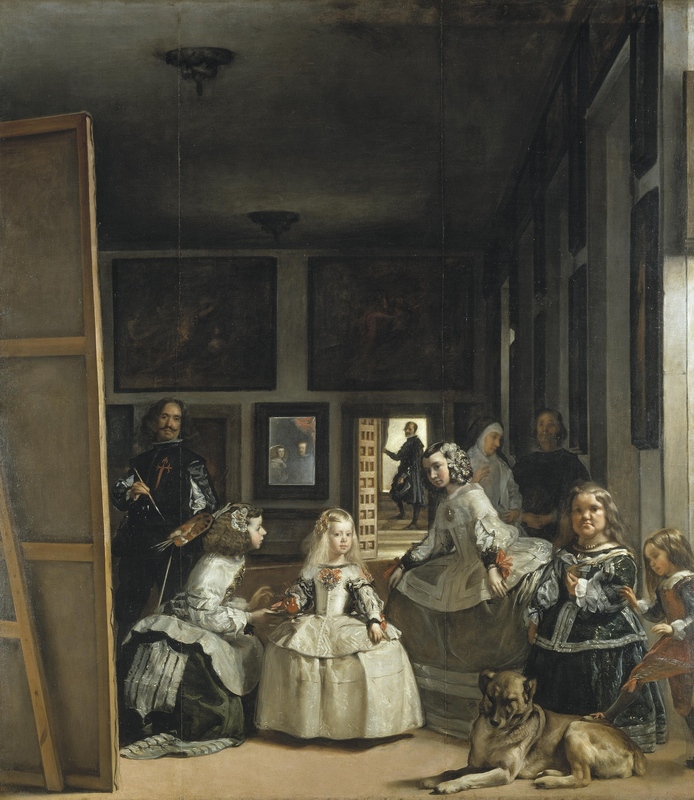 There was some really nice work inside the museum but one of the most interesting was the Las Meninas. This painting was to be of the King and Queen but instead they are represented in the mirror in the far back causing the viewer to be placed as the King and Queen. 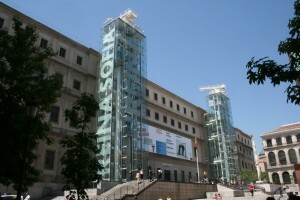 We approached the Reina Sofia from the plaza on the opposite side of the new addition. From this side the only visible signs of the addition is a pair of elevator towers. 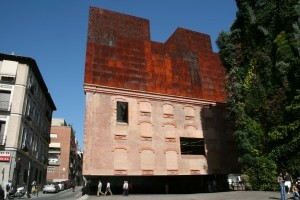 In Spain it is common for banks to create free cultural institutions and the Caixa Forum is one of the prominent examples. 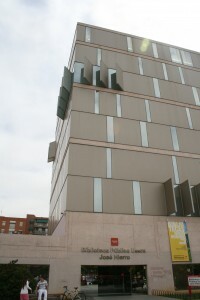 The bank la Caixa commissioned Herzog & de Meuron to design this building. The building is built within and on top of the hollowed out existing industrial building. We started class at the Circulo de Bellas Artes, located across from the Metropolis Building, where we learned that Cafe Americano is coffee with water added. 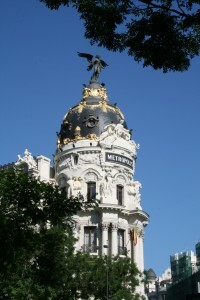 From this point we started to walk down Calle de Alcala to Paseo del Prado which is the major cultural axis in the city of Madrid. Although not the entire day was spent at the playground we sent a few hours playing on the playground in Plaza Tirso de Molina. They had some great jungle gym items I had not seen before but I was slightly disappointed at the lack of swings. Other than that we took it relatively easy in order to prepare for the start of classes the next day. The first day we had in Madrid was spent wandering around but first we went over to another hostel to meet Tyler to go and get phones but ended up waiting for a little while until all of a sudden I heard someone calling, “Jake, Aric” and we looked up and at the same time both said “Joe?” who was leaning out his window. I was extremely excited because I have never had a conversation with someone who was leaning out a window. This started the day where we wandered around and ended up at the nearby plaza Sol where we ended up getting phones. We headed back to Las Musas before setting out again. On the way out this time we noticed a building that pretty much looked like any other building except the facade was an Escher print. We arrived in Madrid late at night from our Ryanair flight. This was my first experience with a super-low cost carrier (they make Southwest look fancy). The plane itself was nice but was very bare bones with simple plastic backed seats that had no pockets to select you own seating. Unlike other airlines you received nothing without paying including any sort of snack.